Adaptive filtering algorithms have been proposed to improve the performance in terms of their steady- state error and convergence rate. They have also been developed to counter the effects of measurement noise. The conventional Least Mean Square (LMS) algorithm has been by far the most important in terms of its simplicity and range of applications. One of the Newton's method-based variants, the Recursive Least-Squares (RLS) is considered to be the fastest in convergence providing lower steady- state error. Thus it has been a centre point of extensive research. By comparison the Least-Mean Fourth (LMF) algorithm that gives better convergence rate in non-Gaussian noise environment has yet to evolve to its Newton's method-based variant. The aim of this work is to develop a Newton's method-based variant of the LMF algorithm. 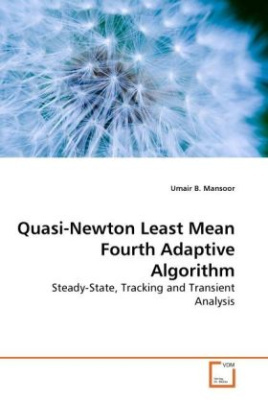 A Quasi-Newton Least- Mean Fourth (QNLMF) adaptive algorithm have been developed and analyzed. It is also compared with the RLS algorithm.